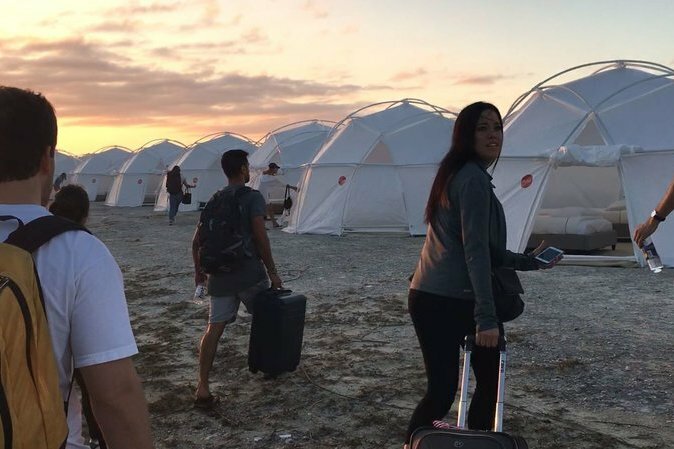 It looks like Netflix's documentary, “Fyre Festival: The Greatest Party that Never Happened" has done a little more good than expected. Maryanne Rolle, who was hired to cater Fyre Festival but was never compensated, asked for help through a fundraising campaign on GoFundMe and she exceeded her goal with over $130,000. The caterer spoke openly about her experience working for the festival on the Netflix documentary and how it affected her. Billy McFarland and his team never paid Rolle or any of the Bahamian staffers who were hired to construct the festival. Originally Rolle, who owns Exuma Point Resort, Bar and Grille, was hired to feed the festival staffers, but once it became clear the festival was not happening Rolle produced meals for the guests and organizers. She used $50,0000 of her personal life savings to pay her workers, but McFarland and his team never reimbursed her. "As I make this plea it's hard to believe and embarrassing to admit that I was not paid," she wrote on GoFundMe. "I was left in a big hole! My life was changed forever, and my credit was ruined by Fyre Fest. My only resource today is to appeal for help. There is an old saying that goes 'bad publicity is better than no publicity' and I pray that whoever reads this plea is able to assist." Elliot Tebele, founder of Jerry Media, executive produced the Fyre documentary, and originally did promotional work for the festival. He claims he was only paid $30,000 for $185,000 worth of work, but he took that money and donated it to Rolle's campaign. "Just gave every dollar my agency earned from the Fyre Festival back to the go fund me. Others should do the same," Tebele says on Twitter. Since the documentary Ja Rule, who was originally one of McFarland's partners, has apologized to Rolle for what happened. He wrote on Instagram, “My heart goes out to this lovely lady... MaryAnne Rolle we’ve never met but I’m devastated that something that was meant to be amazing, turn out to be such a disaster and hurt so many ppl... SORRY to anyone who has been negatively effected by the festival... Rule." One twitter user responded to Rule's statement, "She cooked the food y'all paid her for." Another user replied, "1) That's what is served AFTER the other food runs out 2). Last time I checked EVEN CHEESE SANDWICHES COST MONEY!!" "Fyre Festival: The Greatest Party that Never Happened" is available on Netflix.